The parent company to both the Freightliner and Western Star truck brands, Daimler Trucks, has made a bold prediction for the year based on only the first months of 2015. This year, they believe, will be the year of “significant profits,” not to mention substantial increases in heavy-duty and medium-duty truck sales in North America. Read on to learn more about what exactly Daimler expects to do as we head into the second half of the decade! 2014 was an incredible year for the trucking industry. With high sales figures, new technological and safety innovations, and a steadily improving economy, fleet owners and truck drivers alike benefitted and looked forward to the coming year as an opportunity to continue this great work. So now that the first month of 2015 has come and gone, how did the trucking industry fare? Read on to find out! According to a recent article from Transport Topics, this past January saw a 22.8 percent increase in Class 8 truck sales, a clear continuation of the impressive figures of 2014. This debut shows the highest total of sales in eight years; 2007 was the last year to produce such high figures. That’s not to say that this came as a surprise, however. Leaders in the trucking industry have been taking note of these ever-increasing Class 8 sales figures and similar good signs for a while now, and so the start to 2015 was always projected to be a positive one. So what exactly is being identified as the top contributing factor of these sales? One aspect in particular has been singled out: the fact that fleet owners are all reaching the point in their truck ownership “cycle” when it is time to replace outdated and older models with new ones. Trucks that have been on the road for years are now being retired in favor of the modern models with all of their upgraded technology. Because it will take a while for this cycle of replacement-truck purchasing to complete, the industry can look forward to similarly high Class 8 truck sales for the foreseeable future. If you’re in the trucking business or are looking to discover more about Class 8 truck sales, call on Baltimore Freightliner-Western Star. You can call toll-free at 800-832-7278 or locally at 410-685-4474 or email us your questions and concerns at info@baltimorefreightliner.com. Though industry leader Cummins continues its reign as the top seller for Class 8 engines, that could soon change with an influx of activity from the original equipment manufacturers. OEMs have had more and more success recently selling their own engines to accompany Class 8 trucks, giving them an edge over market leaders like Cummins. Read on to find out more about this latest trucking industry news! According to an article in Transport Topics, 182,000 out of 295,000 engines in heavy-duty vehicles were both built and installed by the OEM that made the truck itself in 2014. That makes for an over 60 percent majority of Class 8 engines! Of these engines, 27.5 percent of them were built and installed by Daimler Trucks North America, an increase over DTNA’s 25.9 percentage share in the previous year. Though it stayed in the top spot for majority of engine installations at 38.4 percent, manufacturer Cummins did see a slight decline in favor of OEMs. Freightliner Trucks, as many other top-tier truck brands, did rely on Cummins for a good number of its engine installations in 2014, totaling about 25.7 percent. But because this constitutes a nearly 5 percent drop from the percentage used in 2012, it is evident that Freightliner is taking advantage of OEM engines like so many other brands in the industry. As trends continue to shift in the trucking industry, only time will tell how many companies will come to rely solely on OEM Class 8 engines in the future. 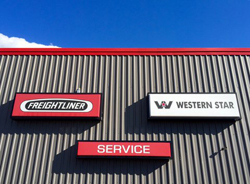 If you’re in the trucking business or are looking to discover more about OEMs and Class 8 engines, call on Baltimore Freightliner-Western Star to take care of your trucking needs. You can call toll-free at 800-832-7278 or locally at 410-685-4474 or email us your questions and concerns at info@baltimorefreightliner.com. One of Freightliner Trucks’ most popular medium-duty vehicles, the M2 106, recently got a makeover that should improve both driver experience and performance quality overall. So what can fleet owners expect to see from this new and improved Class 6/7 truck? Read on to find out! –Allison Transmission’s FuelSense Technology. This software system helps trucks maximize their overall efficiency by taking load, grade, weight, and other factors into account and automatically shifting transmission cycles to accommodate them the right way. 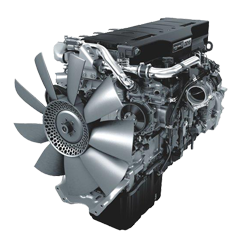 As a part of the M2 106’s optional Efficiency Package, this technology also includes a high-power Cummins ISB6.7 engine. –The Driver Retention Package. Not all modifications have to be made with performance in mind: some are simple aesthetic improvements that make a huge difference to hard-working drivers. With this new package, drivers of the M2 106 will have satellite radio, a heated, ergonomic driver’s seat, adjustable steering columns, in-dash power outlets, and luxurious wood grain paneling to make their driving experience more enjoyable. -The Professional Image Package. A sleek new look for the M2 106, this package includes chrome grilles and headlight bezels, polished stainless steel steps, a painted-band fuel tank, bright-finished heated mirrors, and more. This truck design will be sure to make a statement out on the road. Interested in the new design of the medium-duty M2 106? 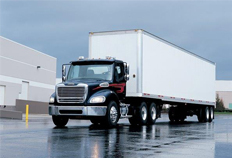 Get in touch with Baltimore Freightliner today!